Earlier this week, The Trevor Project hosted its 2017 TrevorLIVE New York gala at the Marriott Marquis in Times Square. Imagine Dragons lead singer Dan Reynolds was honored with The Trevor Project’s Hero Award, LGBTQ advocate and equality trailblazer Edie Windsor received the Icon Award, and Deloitte was honored with the 20/20 award. The star-studded event was led by Last Week Tonight host John Oliver, and featured special performances by Grammy Award-winning rock band Imagine Dragons and Broadway stars Shoshana Bean and Jeremy Jordan. Additional guests included BD Wong, Brendan Monaghan, Dana Goldberg, Denis O’Hare, EJ Johnson, Eli Tokash, Eric Rutherford, Freema Agyeman, Gideon Glick, Jackie Cruz, James Lecesne, Mark Herman, Mark Myars, Mark Woods, Max Emerson, Micah Jesse, Mila Jam, Omar Sharif Jr., Parker Hurley, Peggy Rajski, Randy Rainbow, Ryan Jordan Santana, Taye Diggs, Tim Davis, and Tyler Glenn. 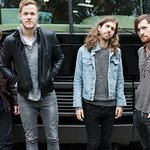 During the event, Imagine Dragons, who played stripped down versions of their hits including “Radioactive” and new singles “Believer” and “Whatever It Takes”, announced a new music festival called “Love Loud” that will take place August 26 in Provo, Utah to support LGBTQ charities including The Trevor Project. Broadway star Shoshana Bean and Jeremy Jordan opened the show in true Broadway fashion with a choreographed original musical number “I Wish I Were Gay”. For more information on TrevorLIVE New York here.